RV Tire Safety: Can TPMS provide advance warning of a Belt/Tread Separation? Can TPMS provide advance warning of a Belt/Tread Separation? Someone said "How do you know if you have picked up a nail, which is leaking air, since your last walk around? A TPMS is like a fuel gauge. You could always dip your fuel tanks at every stop too." Another reader replied "Great point; I might add, if there is something happening to the tire like tread separation which could lead to a blowout the temp likely would be going up and the alarm would sound and show temp compared to other tires.... I have read here on the Forum and other Forum's several incidents where a blown tire has caused extensive damage. Same if you picked up a nail or something where a "slow leak" might become a fast leak after your back driving on the highway... Like insurance...but, maybe not worth it to some folks." As a tire engineer, I am sorry to inform you that having a belt separation will probably not generate enough heat to set the TPMS warning off. 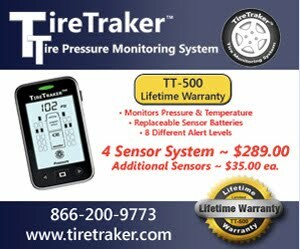 TPMS stands for Tire Pressure Monitor System. It does not and for all intents and purposes can not provide advance warning of a tire failure due to belt/tread separation. Air leaks can cause failures in a few miles as seen in my blog post on Blowout a real-life experience on an Airstream, to after a few hours depending on how fast the leak is. Some TPM offer warning if the pressure drops by just a couple psi in a couple of minutes or less. Some will not warn till you drop 15% to 25% below the cold inflation pressure which means you first have to lose the pressure you gained from normal driving. I know of no consumer-level device that can advise of a belt separation as separation can take thousands of miles to grow large enough to result in the tire coming apart. I have posted on this blog on how to do a thorough tire inspection to discover if you have a separation. Even a video and pictures of a tire belt separation before the tire came apart. I covered the "Why" of tire failures in THIS post. Did you read and understand that information?